Increase Customer Satisfaction with Minimal Efforts! Live chat software provides comprehensive help desk solution to interact with your website customers or visitor’s in real time. Chat application helps in providing real time live communication between online customers and company representatives. Online help support software features text chat, offline messaging, operator to operator chat, canned message facility and many more that assists agents to easily resolve the visitor`s queries and know more about customer need. Proactive chat software integrates the live chat, e-mail and visitor records to improve online sales and customer’s support. 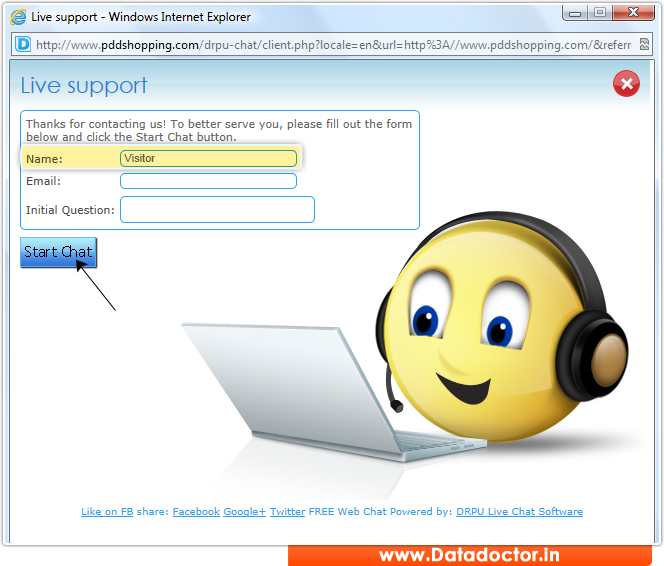 Chat software provides live chat support to multiple website visitors at a time. Live chat software for websites is professional, reliable and useful for online business users, ecommerce sites and various other enterprises. » Real-time live chat: Provides real time chat interaction between the customer support executives and online customers or visitors. » Creates Multi Departments: Creates many number of departments according to need and requirements. » Chat Transfer Facility: Facilitate to transfer chat from one operator to another in any department during ongoing chat sessions. » View chat history, Visitor’s details: Customer executive can easily view chat history details of any chat session. » E-mail Chat Transcripts: Provide facility of automatically sending Live chat sessions to visitors on their specified email address so that they can go through the discussion in future when required. » Offline messages: Helps visitors to send instant message to the offline operator specifying his name, phone number, email id, contact address and message details.